Chalfont and Latimer are our two main customs for this episode. 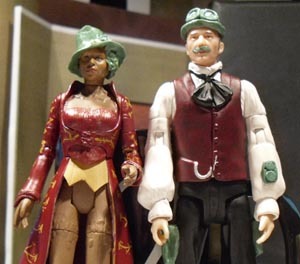 Latimer is a regenerated Master figure with a moustache, hat and goggles made out of greenstuff. As the more technological of the two he has a few pockets and gadgets added to his clothes. Chalfont is a Jabe figure with the addition of a hat using green stuff and a section removed from her skirt. They were originally called Helya and Kivron in the script but I decided those names were far too non-descript and unmemorable. I needed something that fitted the steampunk style I'd given the figures. Chalfont & Latimer is the name of a rail station on the Metropolitan Line in London. 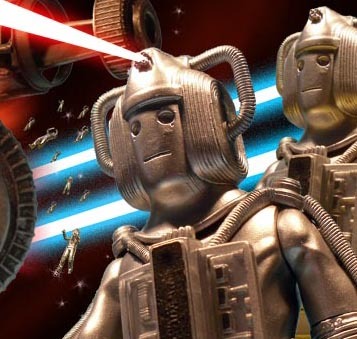 With every story, I've had the approach of 'if this episode was being made in this era, what would the Daleks and Cybermen look like' hence we see the Revenge Cybermen here. I decided against the Revenge cybermat though, opting for the superior looking Closing Time version. 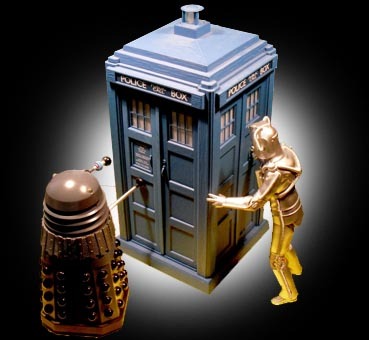 As the penultimate chapter of the Daleks v Cybermen arc I wanted to ramp up the action. 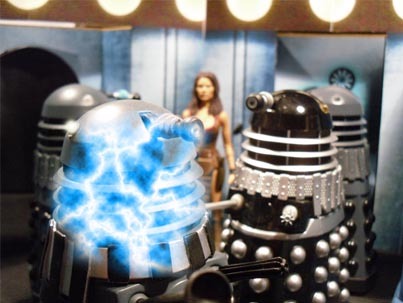 The last two stories had shown events beyond the actual conflict so at this stage it was necessary to show the war at its height with the massive weapons the Cybermen and Daleks had at their disposal. It's also time to reveal a few things about the ongoing arc. All will be explained next time. The script was completed on 18th June 2012. The TARDIS interior scenes for the entire arc were done on 1 September 2012. For this session, the Doctor dressed in the space suit used by the tenth Doctor in The Satan Pit. Continuing the block filming for the whole saga, the Dalek ship interiors were shot on 8 Oct 2012 and the Cyberman ship interiors done on 22 November. 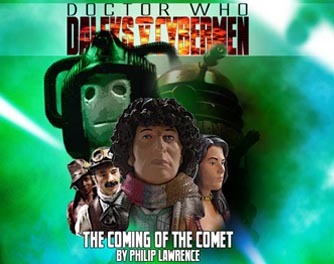 By 18th April 2013, I'd come to realise that the NASA space suit used on The Impossible Astronaut would be more appropriate attire for the 1970s 4th Doctor so I reshot the TARDIS interior scenes and continued with the Doctor/ Space suit combo for the comet exterior scenes on the same day. The comet uses my stock, home-made polystyrene rocks with silver crepe paper as the base. On 19th April, shooting moved to the planetoid surface- sheets of white crepe paper- and then to the Archivists ship which was put together using lots of stock walls and props. On 20th April I did the model shots for the story. The final piece of the puzzle was the shot of the underground cavern which was shot on 13 June 2013 at the same time as some footage for the finale. You may recognise Latimer's probe as one of Darth Maul's probe droids. The story was edited way ahead of it's projected transmission time and was completed even before it's predecessor An Unfair Advantage. 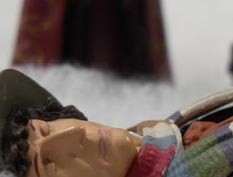 The last shot to be done was the final panel of the 7th Doctor. It was completely rewritten given that the finale itself has been rewritten a bit since this story was completed. The image uses pictures from last year's Cradle Will Fall. Part one was published online on 23 September 2013 with Part Two following on time on 23 October. 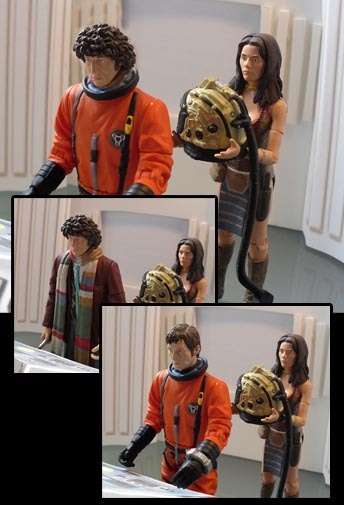 For the 4th Doctor and Leela, this story takes place sometime between The Invisible Enemy and The Invasion of Time. If there are a few conveniences that don't make sense yet, don't worry, they will. Stay tuned to the AFT. In the run up to December's finale, I'll do a run down of all the clues you might have missed and address questions that need to be answered. If you have any, do let me know.